Are there any hidden Vedantic or any other philosophical teachings in the stories of Mahabharata? Is Mahabharata a mere Ithihasa or whether the stories of Mahabharata have any hidden esoteric or metaphorical meanings? It is part of Mahabharata, Bhishma Parva, Adhyaya 23-40. This is considered a very important philosophical scripture and extract of Upanishads. It is one of the three important scriptures (Prasthanatrayi) of Vedanta Darshana (other two being Upanishads and Brahma Sutras). Many Acharyas like Adi Shankaracharya, Ramanujacharya who expounded doctrines of Vedanta viz. Advaita, Vishishtadvaita, Dvaita etc., have written commentaries to establish or support their doctrines. Well in Mahabharata we have the Sanat Sujatayia portion found in the Udyog Parva which is one of the important texts for the philosophy called Advaita Vedanta. The Sānatsujātiya refers to a portion of the Mahābhārata, a Hindu epic. 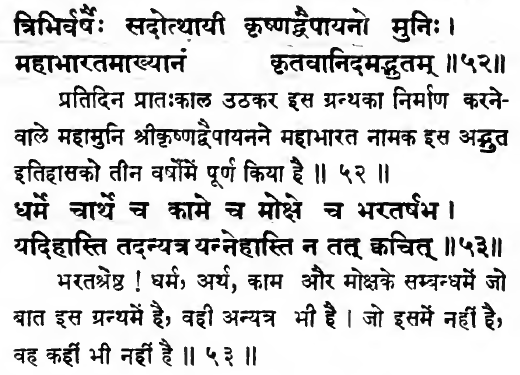 It appears in the Udyoga Parva (book), and is composed of five chapters (Adyāya 41–46).2 One reason for the Sānatsujātiya's importance is that it was commented upon by Adi Shankara,2 the preeminent expositor of Advaita Vedanta, and one of the most important Hindu sages, philosophers, and mystics. Sanatsujata was the sage who dispelled the doubts that appeared in king Dhritarashtra's mind. This text along with YogaVashishta, Ashtavakra Gita etc are very important texts for the Advaita Vedanta school. So, yes there are philosophical Vedantic teachings in Mahabharata. The Vedantic and philosophical teaching is not hidden in Mahabharata. It is out there in the open. The sage Vyasa tells the reader the reason for his writing the Mahabharata. It is to teach the reader about the philosophy of the Sruti and the four Purusharthas (goals of life), dharma, artha, kama and moksha and how best to attain these goals. The most famous teaching is of course the Bhagavad Gita. In this process of teaching it gives the reader instruction about how to lead a useful life. Bhagavad Gita: Part of Bhishma Parva of Mahabharata. It has such philosophical teachings that most of scholars have provided commentaries on it. Bhishma's teachings to Yudhishthira: Part of Santi Parva & Anusasana Parva of Mahabharata. It includes weighty treatises on topics such as kingcraft, metaphysics, cosmology, geography, mythology and discussions of the Sankya and Yoga philosophical schools. Anything which is there in the world is in Mahabharata, Mahabharata has everything which is there in the world. [Vaisampayana to son of Parikshit:] The sage Krishna-Dwaipayana regularly rising for three years, composed this wonderful history called Mahabharata. O bull amongst the Bharata monarchs, whatever is spoken [in Mahabharata] about virtue, wealth, pleasure, and salvation may be seen elsewhere; but whatever is not contained in this [Mahabharata] is not to be found anywhere. Not the answer you're looking for? Browse other questions tagged mahabharata philosophy vedanta . What are the qualities or attributes that differentiate Sanathana Dharma from other religious faiths? Did Vinata have any doubts about the outcome of her bet with Kadru in the Mahabharata?